To Cite: Mohajeri G, Sayadi Shahraki M, Mahmoudieh M, Keleidary B, Afshar Moghaddam N, et al. A Case of Complete Video-Assisted Thoracoscopic Surgery (VATS) for Thymoma With Pure Red Cell Aplasia (PRCA), J Minim Invasive Surg Sci. 2015 ; 4(1):e24349. Introduction: Although thymoma is the most common anterior mediastinal tumor, only 5% of thymoma cases develop pure red cell aplasia (PRCA). Case Presentation: In this article we have reported a 59-year-old man with a large anterior mediastinal mass (diameter of 10 cm) and severe anemia, that thymoma and pure red cell aplasia have been demonstrated by histopathologic and hematological examination. Despite the large mass, a complete video-assisted thoracoscopic surgery (VATS) thymectomy and combinational medical therapy were performed for him successfully. Aplasia remission occurred 6 months after thymectomy and his hemoglobin level reached to 13 g/dL. Conclusions: We believe that a complete resection in combination with medical therapy is necessary to achieve total remission of PRCA symptoms and conclude that VATS thymectomy is an effective and technically feasible procedure for surgery without any contraindications about the size of the thymoma in these patients. Among the anterior mediastinal tumors, thymoma, the most common, can occur sporadically or in association with other diseases, such as myasthenia gravis, pure red cell aplasia (PRCA), and hypogammaglobulinemia (1). A rare cause of anemiais PRCA that is determined by absence of red blood cell precursors in the bone marrow (2, 3). This rare cause of anemia has been described in 1922 (4). About 5% of thymoma cases are associated with PRCA (4). Thymectomy is usually indicated in these patients. A 59-year-old man with chronic fatigue referred to our surgical center. His initial hemoglobin level was 5.5 g/dL. Upper gastrointestinal endoscopy and colonoscopy were normal. Because the cause of anemia was unknown, he was treated with Eprex and transfusion of two units of packed red blood cells every two weeks and because of high serum ferritin level desferan therapy was initiated for him. Two months later his hemoglobin level decreased to 3.5 g/dL and the reticulocyte count became zero. Peripheral blood smear showed normocytic normochromic anemia but no bone marrow aspiration was done before the surgery. Chest X-ray and computed tomography (CT) of the thorax showed a mass with diameter of 10 cm in anterior mediastinum without invasion to other organs (Figure 1). The clinical and radiological findings were consistent with diagnosis of thymoma associated with PRCA. According to this data, the patient was candidate for elective complete video-assisted thoracoscopic surgery (VATS) thymectomy and mass resection. Surgery was done by the right hemithorax approach and thoracoscopic instruments and Ultrasonic dissection handle. The operation took about 150 minutes and the specimen was removed with endobag without any extension of port’s site incision. During the surgery Bleeding from a venous branch in junction of two brachiocephalic veins occurred that was controlled by endoscopic suturing. At the end of the operation pleural catheter was removed with re-expansion of lung. The diameter of resected specimen was about 15 × 10 × 5 cm and weighed 200 g. admission to Intensive Care Unit (ICU) was not required and the patient was discharged two days after surgery. The diagnosis was confirmed by pathological analysis as thymoma type A of the World Health Organization (WHO) classification (Figure 2). The postoperative course was slightly complicated with pneumonia two months after operation that was treated by oral antibiotics without hospitalization. Three months after the surgery the level of his hemoglobin reached 10 g/dL, but fell to 7 g/dL five months later again. Other evaluations and imagings did not show any recurrence. In this stage corticosteroid and cyclosporine therapy was started for him. Bone marrow aspiration was performed 5 months after thymectomy that showed normocellular particles with sufficient hematopoietic cells and on immunohistochemical staining, keratin (CK) and Epithelial membrane antigen (EMA) were positive; but CD20, CD15, CD30, CD5, Chromogranin, Synaptophysin, CD117, and PLAP markers were negative. After 14 months of surgery, his hemoglobin level reached 13 g/dL. 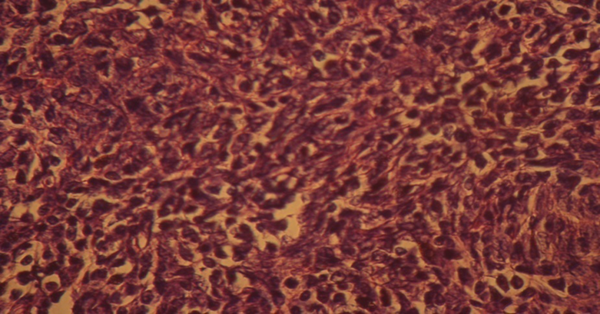 The Pseudomesenchymal Appearance of the Tumor is Remarkable (H and E Staining × 400). PRCA is a normocytic, normochromic anemia due to an absence of red cell precursors in the bone marrow. For diagnosis of PRCA, bone marrow aspiration and biopsy is necessary. For rule outing associated diseases like thymoma or lymphoid malignancyin these cases, CT scan is necessary (4). Because the high risk of thymoma in patients with PRCA, a thymic mass in this cases will be resected without preoperative histologic confirmation. Although trans-sternal thymectomy is one common method of surgery with low morbidity and mortality, but VATS approach is the new and best method now. This technique has several advantages, such as less postoperative morbidity and minimal discomfort after surgery in patients (5). Other thymoma-associated syndromes, such as myasthenia gravis, respond to thymectomy better than PRCA, because the initial remission rate for PRCA is around 30% (1). In addition, in patients with myasthenia graviseven in absence of obvious thymoma, respond to surgery is good, but in PRCA without an identifiable thymoma, surgery has no indication (6). Thampson CA and his colleagues reported 12 patients with PRCA associated with thymoma who underwent thymectomy, but, just like our patient, none of them achieved complete remission of their anemia after thymectomy alone; remission was only possible with the addition of an adjuvant drug regimen consisting of steroids, cyclosporine, or cyclophosphamide (4). This case had thymoma type A associated with PRCA that was treated with combination of VATS thymectomy and medical therapy. Nakada et al. report a case, similar to ours, that was treated successfully with VATS procedure (7), but their patient underwent thoracoscopy with open surgery devices, while in our case the size of thymic mass was greater and the surgery was performed through thoracoscopic approach and instruments. Our patient was treated with prednisolone for a short period before surgery and only received Eprex for 3 months after surgery and his hemoglobin level reached to 10 g/dL but fell to 7 g/dL again, that treatment was done by adding corticosteroid and cyclosporine to his drug regimen. To sum up, we believe that a complete resection in combination with medical therapy is necessary to achieve total remission the symptoms of PRCA with thymoma and conclude that VATS thymectomy is an effective and technically feasible procedure and there are not any contraindications about the size of the thymoma for this procedure. I would like to express my deepest appreciation to all those who provided me the possibility to complete this report. A special gratitude I give to our colleagues in Isfahan Minimally Invasive and Obesity (IMISO) research center, whose contribution in stimulating suggestions and encouragement, helped me to coordinate my project, especially in writing this report. Author's Contributions: Study concept and design: Masoud Sayadi Shahraki. Drafting of the manuscript: Mohsen Mahmoudieh, Behrouz Keleidari, Ebrahim Nourian. Critical revision of the manuscript for important intellectual content: Gholamreza Mohajeri. Administrative, technical, and material support: Noushin AfsharMoghadam. Funding/Support: This study was supported by Isfahan Minimally Invasive and Obesity (IMISO) center.